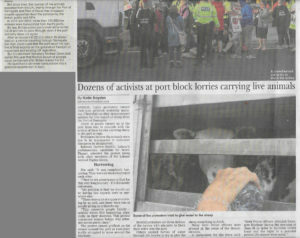 On 28 June, three lorries packed full of live sheep were taken to the Port of Ramsgate for export. They were being transported to the continent for slaughter. In sweltering, cramped conditions, the sheep were being deprived of water and food and clearly distressed. This barbaric trade must be stopped, in Ramsgate and elsewhere. This is clearly a very pertinent issue, with more than 180,000 people reached by a Facebook post on the subject. The Isle of Thanet Gazette ran an article on the protest illustrated with photographs taken during the morning.